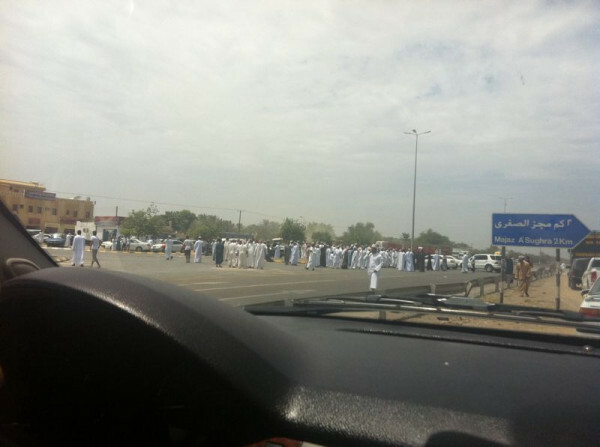 Just in now... there are riots again in the Batinah region, with the highway being blocked again. Special thanks to @BaderHinai for updating us and sharing the pictures. 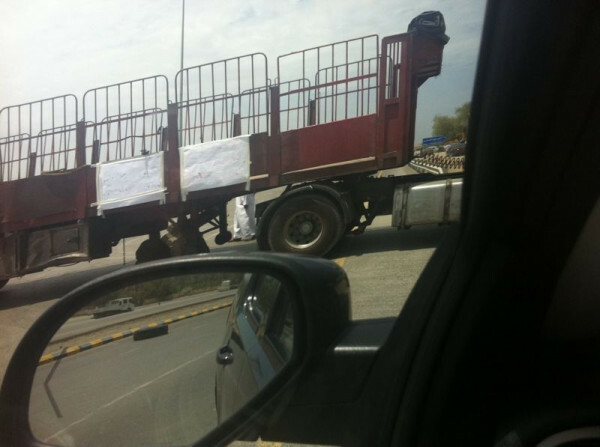 The riots are in Suwaiq / Sohar. More news later if it develops. Apparently they are reaffirming their demands from before. It does not appear to be a peaceful demonstration. From what I hear there was an accident involving a large truck at one of the highway crossings which resulted in the blocking of the highway. The people of the area gathered around the truck in protest demanding that government should do something to reduce the number of accidents at that crossing by either building a roundabout or putting traffic lights. People who were passin their way to or from Sohar saw the commotion and started to broadcast the news that are new protests in Sohar and people are blocking the road again without stopping to get the actual story. Somebody needs to clamp down hard on this now. 1) I know of too many situations following the first 'wave' of incidents that has led to Omani's having 'carte blanche' at work and either threatening expats (whether management or otherwise) or coming out with statements such as: "well, what are you going to do about it, I'm Omani?!" 2) If the above continues, it will spell disaster for the economy, since it compound with Omanisation to result in a workforce that is not equipped to do a job as expat numbers lessen, and who will set a terrible workplace example for new people coming in. How can somebody with such an attitude ever acquire the necessary business skills (in so many areas)? i am sick n tired of all these!!!! The biggest problem in oman is omaniation!!!! The govt is stuck in a fix, the omanis are not skilled enough to do jobs and theres a large no of young omanis seeking employement. Unfortunately the private sectors gotta take the hit. I dont really know how long this is gonna last. ohhh.... the Anonymous ppl have the gutts to show ur faces tsk tsk... this is aimed at the last comment ... "pack ur bags"
OMG ! I hope this doesnt spiral into new wave of protest. Summer is slowly dipping. If HOT WEATHER was deterrent in fading the protest in March/ April, it would be disaster. Truly. Doesn't look like a riot to me. Looks like people standing in the road. Whatever reason for their being in the road, I think it's important not to use emotive language implying violent disorder, when the pictures show nothing of the sort.